The Seabrook logo is really well designed, but that is effectively the whole bag. The flavours are colour coded. 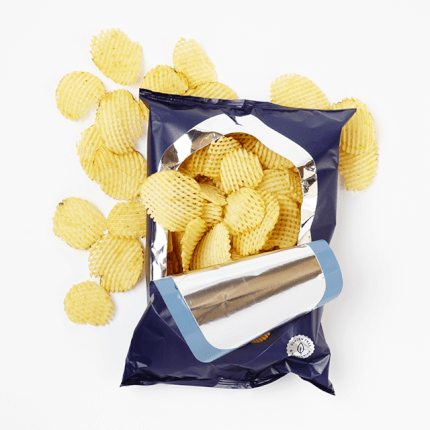 There are two graphic Crisps, but that’s it. 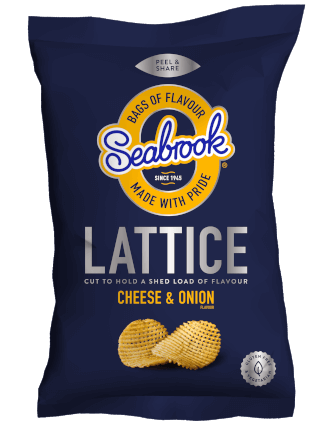 Actually, that’s not it – there was a gimmick to add to the Lattice Shaped Crisps. The bag was a tear and share bag where you peel back the centre to create a sort of bowl. This meant that you could not access the crumbs easily, but it also meant they could be sealed easily for further eating pleasure. A good idea, but poorly executed because the insides could not be easily accessed. As these were thickly sliced, the Crunch was as expected, a little biscuit like with no real crack or crackle, but this in turn meant they didn’t immediately mush up like thin and crispy Crisps. These Crisps were fairly thickly cut so they could sustain the relatively unique cutting style. The holes were all visible, which was a shame, we were hoping for some seasoning filled holes. As it was, the seasoning was barely visible on the relatively plain yellow Crisps. There was a very nice, almost sweet balance to these Crisps. There was a medium strength Cheese and a light addition of Onion. As they were fairly thickly cut, the warmth of the Potato arguably seeped through a little more than desired, but it was a good sandwich accompaniment, so not bad.